Place the sugar and water in a small saucepan over low heat. Stir until the sugar dissolves then increase the heat to medium and add the ginger and lemon juice. Simmer for 8-10 minutes until reduced and thickened slightly. Remove from the heat and refrigerate until cold. 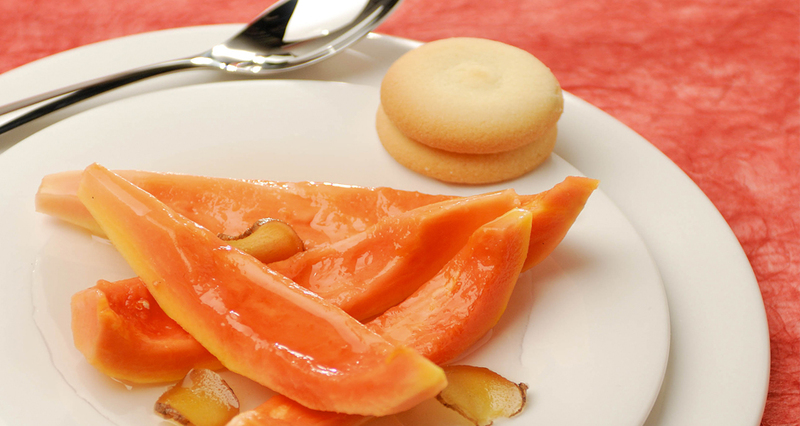 To serve, arrange papaya wedges on serving plates or bowls then drizzle with syrup (you may either remove the ginger before serving or keep it in the syrup). Serve with dessert biscuits. Note: Serve with dessert biscuits such as biscotti, macaroons or shortbread.